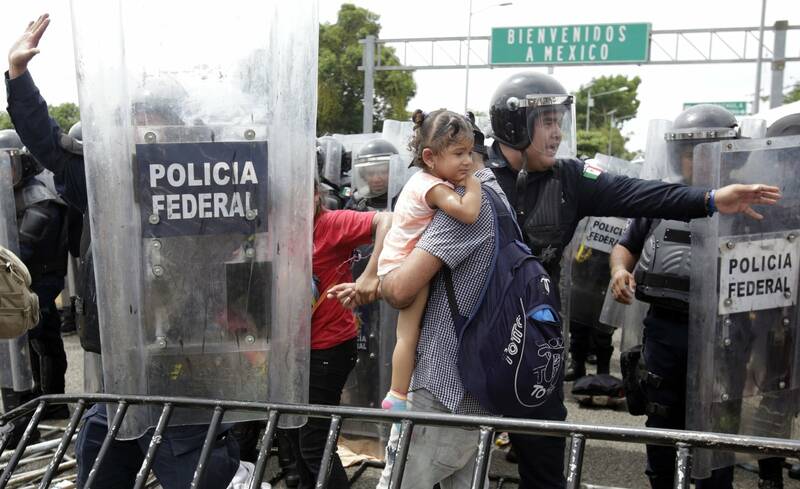 Migrants traveling in a mass caravan burst through a Guatemalan border fence and streamed by the thousands toward Mexican territory on Friday, defying Mexican authorities' entreaties for an orderly crossing and U.S. President Donald Trump's threats of retaliation. Two buses arrived to transport women, children and the elderly to be processed by Mexican immigration authorities. But the migrants refused to board, fearing they would simply be deported. "Walk! Walk!" they chanted, insisting they be allowed to continue on foot. Edwin Santos of San Pedro Sula was one of the first to race by, clutching the hands of his father and wife. "We are going to the United States!" he shouted. "Nobody is going to stop us!" Elizabeth Oglesby, a professor at the University of Arizona's Center for Latin America, said people join caravans like this because it's a way to make the journey in a relatively safe manner and avoid having to pay thousands of dollars to smugglers. She disputed Pompeo's claim that migration is a "crisis." "Yes, we are seeing some spikes in Central Americans crossing the border, but overall migration is at a 40-year low," Oglesby said.